The purpose of a wine cabinet is to allow wines to mature/be stored at a steady, stable rate and prevent them from spoiling. We have a great selection of Liebherr wine cabinets available for you including: single temperature, 2/3 temperature and multi-temperature depending on your needs and requirements. Liebherr wine cabinets have a temperature range from +5°C up to +20°C. We know it can sometimes be tricky knowing which wine cabinet or fridge to buy for your home, bar or restaurant, therefore we have produced this simple guide to help make your decision easier. Which Liebherr wine cabinet is right for you? What are the different types of wine cabinets? Single temperature wine cabinets are ideal for wine enthusiasts as they are suitable for the long term storage of wine bottles making it a beneficial long-term investment. This type of wine cabinet maintains one consistent temperature and can be adjusted as necessary. Therefore making single temperature cabinets the ideal and not to mention perfect choice for those red wines with a long life ahead of them. 2-3 temperature wine cabinets are ideal for smaller wine bottle collections, where you can store wines at the correct storage and drinking temperatures. The two or three different sections offer different temperatures; this means you can store a variety of wine bottles. Multi-temperature wine cabinets offer multiple temperature zones for different wine chilling requirements. They are suited for storing different wines at their respective drinking temperatures as well as storing wines for long term storage. 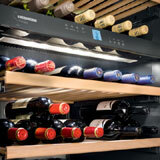 Multi-temperature wine cabinets are ideal if you do not have the benefits of a wine cellar. The Vinidor range is available in different sizes, whereas the GrandCru and Vinothek ranges are available in different sizes and designs. We offer information about the ranges below. 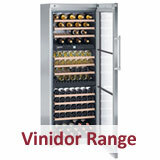 The Vinidor range combines all of the advantages of wine storage and multi-temperature cabinets. This range offers two or three wine compartments which allow wine or champagne to be kept at the ideal serving temperatures. The sleek, stainless steel wine cabinets are ideal for any kitchen, restaurant, pub or bar. In addition these cabinets provide long-term wine storage and are suitable for just about any collection of wines. Different sizes are available allowing storage from between 38 and 211 bottles. 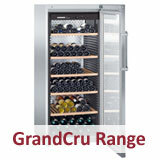 The GrandCru range offers single temperature wine cabinets which are ideal for long term storage. Different sizes and designs are available, from storing 12 to 312 bottles. The WKt 6452 holds 312 bottles with a solid door front, whereas the WKes 553 holds 18 bottles and features a glazed door with stainless steel and silver side walls. We are proud to say the GrandCru range is one of the most energy efficient in Liebherr’s range. In one year alone the GrandCru WKes 653 uses less than half the energy than that of a standard fridge-freezer with A+ energy efficiency class; this is based on statistics provided by Carbon Footprint. The Vinothek range offers single temperature wine cabinets for long term storage of wines and multi-temperature cabinets for storage of wines kept at the perfect drinking temperature. Different sizes and designs are available, from storing 66 to 200 bottles. The Vinothek cabinet’s design differs with each model, such as the door available glazed or solid, and with either a black frame or bordeaux red. You can find the perfect Vinothek wine cabinet to match your home or restaurant. Why choose a Liebherr wine cabinet? 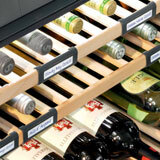 Liebherr wine cabinets offer the ideal storage temperature for wine. The electronic control system and advanced air conditioning technologies guarantee that cabinets maintain a consistent temperature. They can be set to the exact temperature required, within the range of +5 °C to +20 °C. Liebherr wine cabinets, and most specifically Vinidor models, provide the best conditions for wine to age without disturbance such as vibration or fluctuating temperatures. You can feel assured that your wine will develop during storage in most favourable conditions. 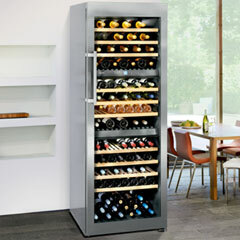 Wine can also be enjoyed at the correct serving temperature with the 2/3 and multi-temperature wine cabinets. So whether you are enjoying a quiet evening in or hosting an opening night at your restaurant a wine cabinet can ensure the drinks are served at the most enjoyable temperature! The air quality of Liebherr wine cabinets ensures a wines taste remains intact. All Liebherr wine cabinets are fitted with activated-charcoal filters which ensure optimum air quality. The active-charcoal filters the incoming air, removing any contaminants and preventing odours affecting the taste of wines stored in the cabinet. The replaceable charcoal filters should be replaced every 9-12 months and are available under Liebherr cabinet accessories. Liebherr wine cabinets ensure the best conditions for both corks and wine! A regulated air circulation and vaporiser system keeps humidity levels high. The correct humidity conditions are vital for wine storage. If humidity levels fall below 50% then corks can shrink, which in turn allows oxygen to penetrate the bottle and evaporation to occur. This can lead to the spoiling of wine, which is never good news! We also like to highlight that these wine cabinets make very little operating noise, ranging from 35dB(A) to 44dB(A). This can be compared to a quiet bedroom at night or whispers in a library! These cabinets provide gentle storage conditions where wine can be stored with minimal, if any, disturbance. The handcrafted wooden shelves are unvarnished in order to eliminate any harmful vapours that would damage or taint the wine. Your bottles of wine can be arranged, in opposite directions in order to maximise shelf space. The Vinidor wine cabinets’ shelves are fitted to telescopic rails. This provides a clear overview of the bottles whilst allowing for easy access. The soft closing door, which closes automatically on reaching a 45° angle (approximately), ensures gentle closure as to not disturb the wine and also prevents accidently slamming the door. Liebherr wine cabinets are also fitted with UV-resistant insulated glass to reflect nearly all the damaging UV radiation. This prevents any deterioration of the wine. LED lighting, in certain Liebherr models, illuminates your bottle collection, providing beautiful presentation which entices your guests! I need a wine cabinet for long term storage of wine? Liebherr single temperature wine cabinets are ideal for long term storage of wine as they provide the correct cellaring conditions. I want to store only white wines, which wine cabinet will suit me? Any Liebherr single temperature cabinet, as it can be set between 12-16 degrees which is the ideal temperature for white wine storage. What is the difference between a single and multi-temperature wine cabinet? 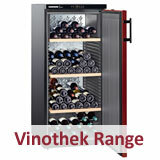 Single temperature wine cabinets are designed to cellar all types of wine including red, white, flat or sparkling. 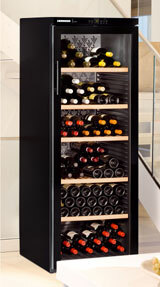 However multi-temperature wine cabinets are specifically designed for the serving of red and white wines. The different sections allow you to easily store/chill different bottles of wine which is then ready to serve at the right temperature as well as store. Multi-temperature wine cabinets are ideal for both the hospitality and domestic sectors. Does it matter where I install my wine cabinet? Wine cabinets work best in areas that have a stable, consistent temperature. This is ideally within the home or a bar, pub, restaurant or hotel. How much noise does a Liebherr wine cabinet create? Will it be noisy in my cellar or room? Liebherr wine cabinets make very little operating noise and range from 35dB(A) to 44dB(A). These low level decibels can be compared to a quiet bedroom at night or whispers in a library! How important is a wine cabinet’s capacity? Liebherr wine cabinets vary in the number of bottles they can store. For a budding wine collector a capacity of 30-50 bottles is more than enough however a capacity of 100-150 is suited to someone that buys by the case. Work out your wine storage needs before purchasing a Liebherr wine cabinet. Will you be adding to your collection? If so, how often? If I have a small but growing collection of wine bottles, which cabinet should I choose? This all comes down to the individual/company and the size of their wine bottle collection. Think ahead, how many additional bottles will you be buying? How often? Always leave some spare space for the unexpected bottles! How long does it take for a Liebherr wine cabinet to be delivered? Liebherr wine cabinets are usually in stock and are delivered between 7-10 working days however it can take up to 4-6 weeks. Availability and delivery dates will be confirmed. If I buy a Liebherr wine cabinet, is it under a guarantee? All Liebherr wine cabinets carry a two year guarantee. You may also be able to purchase an extended guarantee from Liebherr. If you have any questions which we haven’t answered above then please phone us on 01903 786148 or email us. All Liebherr wine cabinets are supplied with a 2 year guarantee after the date of purchase. Give your wine the chance to reach its full potential with a Liebherr wine cabinet!